To participate, search for #TwitterSmarter on Twitter and then click “Latest”. Or just use this link. 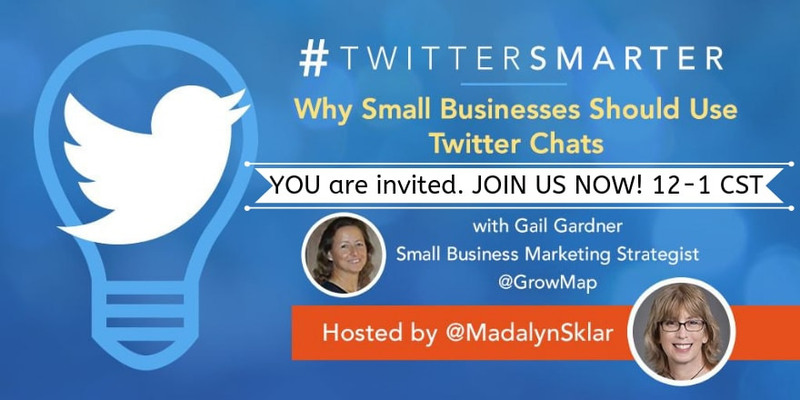 Has your small business considered using Twitter chats to raise their visibility? How about to generate leads? What about to interact with journalists and influencers? Did you know that almost all of my influence grew from my usage of Twitter? My collaborators and I were singled out way back in 2011 by Yahoo! Research and Cornell University in a study of who was influential on Twitter. What about journalists? So many journalists are on Twitter that a study of how journalists use Twitter became a dissertation that led to a book. Some journalists even “wonder if their profession is tweet-crazy“! Others “call for journalists to stop tweeting“. But until that happens, Twitter is your fast path to reaching journalists and influencers. How much could your small business benefit from having a journalist mention you in print, on radio or television. Think of the increased visibility and credibility you would enjoy. I look forward to seeing you on the Twitter chat. If you have questions about how Twitter chats work, you can message me before it starts on Skype (username growmap) and I’ll give you a hand. During the chat I’ll be too busy to respond because #TwitterSmarter is a smokin’ fast chat. They’ve been around a long time and have a lot of loyal influencers, freelancers, SaaS platforms and business owners and employees who are there almost every week. Think of all the great people you can meet. See you there! Hello, It is very interesting post. I always use twitter for my small business. I always keep me update with new trends. Thank you for this post. actually, I don’t use twitter that much but now I think I have to look after it :D.
I’m embarrassed to say that my business isn’t on Twitter. We specialise in IT Services ironically but have never really seen the benefit for us particularly (We do use Facebook). However after coming across this article and a few others I think it’s time for us to officially dive into the Twitter world. This was a excellent read cheers. I will definately use it. Twitter Smarter it’s new to me! Thanks for the new information about twitter chat. TwitterSmarter is a really fast Twitter chat. I often have people start with one that moves a little slower like #vcbuzz to get used to it before they show up for #TwitterSmarter. They get so many tweets so fast that they often trend on Twitter. nice article sir thanks for sharing such amazing information with us.i don’t know the importance of Twitter.after reading your article I know what is the importance of social media for business.thanks again and also keep sharing such amazing information with us. Twitter Chat is very useful for us to connected easily one to another person to grow our business . All good reasons here. Chats on Twitter are just another way to connect with people, and, to help them. Sounds good to me. Plus chats work well with the rapid fire nature of tweeting. I’m a big fan of Twitter Chat. I used it last weekend to resurrect an almost dormant Twitter account. In less than 24 hours I got more than 100 new followers. What amazed me most is that these people never left after participating in that Twitter chat. Now, I’m thinking of extra topic I will discuss this weekend again to get another 100 followers. Thanks for the amazing perspective you gave it here. I look forward to participating in your next Twitter chat. Just this week I heard from someone whose friend got their Twitter account suspended for getting too many new followers too quickly. That concerns me because as you saw, that can happen when you participate in large Twitter chats. She is going to try to reach the person in charge of Twitter in her country and discuss this situation with them. It is a good informative post, thanks #Gail for sharing…. Hi Gail, so sorry I missed this Twitter chat. I need to find some in the early a.m. During mid day I’m meeting with clients and can’t be on Twitter chats 🙁 I do love her chats too and having you on it would be so cool. Do you publish the chat afterwards anywhere online? As far as I know, there is no #TwitterSmarter text summary the way there is one for #VCBuzz. But Madalyn does a Facebook Live recap and you can see the one from this Twitter chat here. I am just Learning to social marketing for my business. Your above information is very helpful to me. I always share my new post on twitter. I do follow your tips. Thanks for sharing valuable information. Through Twitter, we’ll have the opportunity to network with other small business owners and industry experts. I do agree with you. Twitter is very important nowadays because we heard most of the news around us from Twitter. Twitter is very benefiting for small business also. Most of the professional use twitter rather than Facebook. Anyway thanks for sharing such great information with us. Nice post mostly i will post about my website in twitter and it is very useful we can generate traffic also. It’s nice information and very useful. I have used the method you have to explain for twitter platform. Twitter chats have not only helped me to grow my social network on it but also put me in touch with many people who are searching for my services and not aware of me. It is really a good way to get knowledge, recognition, and building a strong network among people and me for my domain. Personal experience, Twitter chats has not only helped grow my network, but also put me in touch with some like minded people. One of them is #SEOTalks and I have learned a lot from those chats. It gives knowledge, recognition, and also helps in building a strong network. I used to spend more time on Facebook, and LinkedIn. But that has changed in last couple of years. So glad I found this … I miss Twitter Parties … informative and fast paced fun! Twitter Chat is very useful when it comes to local business. One of the biggest advantages of Twitter chats is perhaps the most obvious — you can grow your social media following. The best way to reap this benefit is by interacting with the moderator and others involved in the chat. looking forward to leverage them. Get started by using just Twitter natively without a tool. Then you can always learn to do Twitter chats in tools like HootSuite or Agorapulse latter.